I’ll let you in on a little secret: I’m not the biggest Audrey Hepburn fan. I’ll never forget being a little girl and wondering why everyone thought she was so great, but I went along with it anyway, agreeing, “Oh, yes, the most beautiful woman that ever lived.” I assumed I’d figure it out when I was older and able to understand her mystery. Her plain outfits and simple style just struck me as boring, but hey, I dressed up like Pocahontas every day, so what did I know? But here I am, 25 years old and still choosing flashy outfits over simple ones. 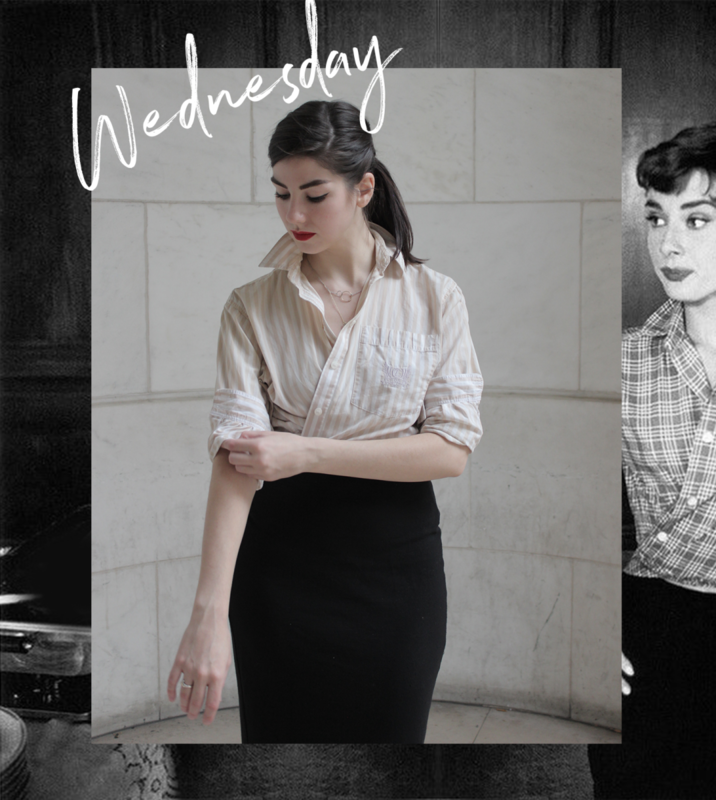 “Perhaps to understand Audrey Hepburn,” I thought, “I’ll have to walk in her shoes.” So I decided to let Audrey metaphorically dress me for one workweek. Here’s what happened when I recreated some of her iconic looks. 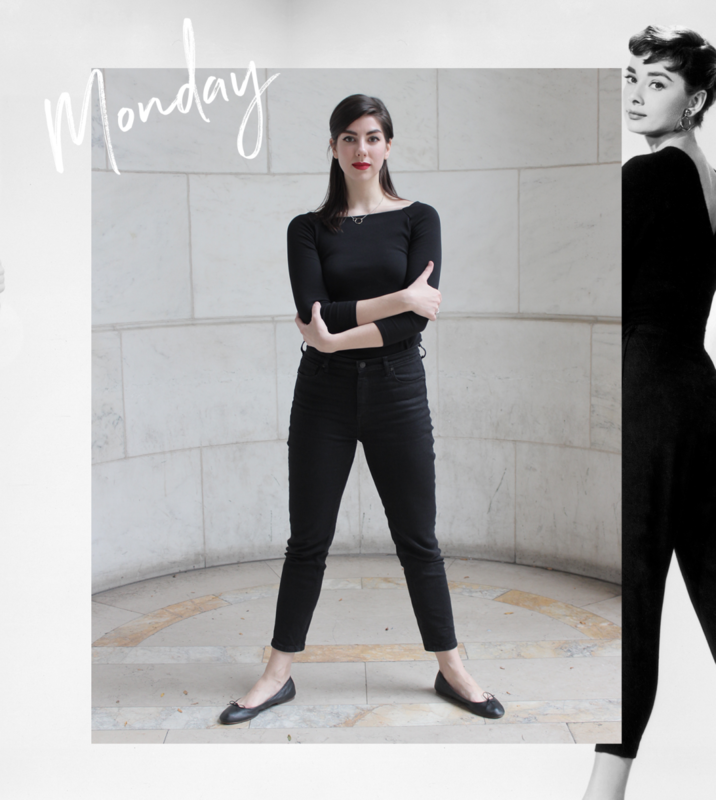 For the first day of the challenge, I did the easiest and most iconic Audrey outfit—her black-on-black look from Sabrina. The outfit was so simple that I felt like I wasn’t dressed up at all. I had to ask, “Am I doing this right?” It felt like an outfit I’d wear when running late to work and throwing on anything that matched (aka all black). But I’ll admit that I felt a bit more carefree by not having to focus on so many moving parts in my outfit. I also liked how it made me look classy even though I put zero effort into the look. 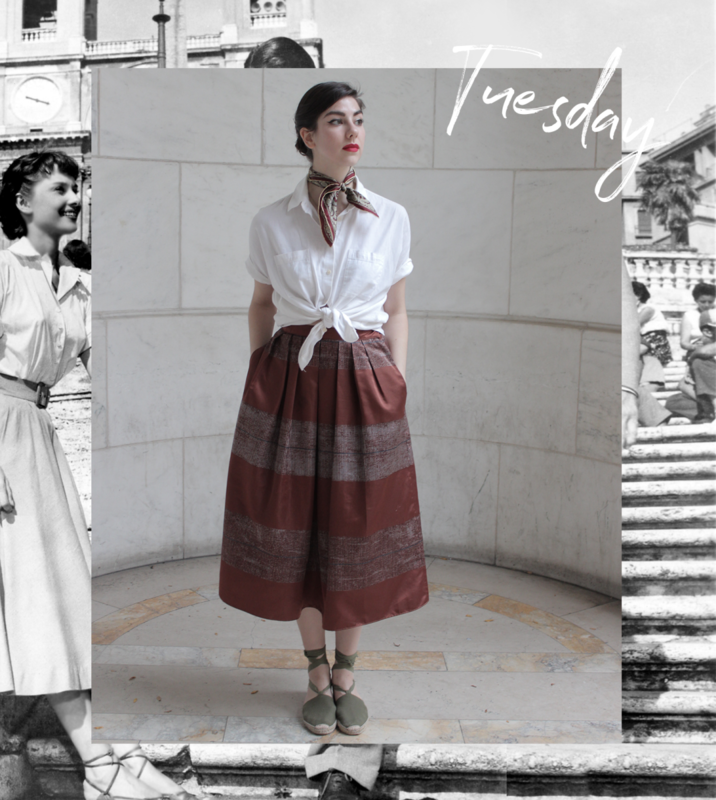 I got a little creative on Tuesday, choosing to copy Audrey’s 1950s look from Roman Holiday. I noticed people on the street looking at me differently. I got that, “Awww, how precious” face from a lot of men, oddly enough. It was sort of patronizing. This look was the most retro and costumey, so I can see how it stood out as being cutesy. Ironically, I actually felt the most myself in this outfit. Perhaps because it was a look I’ve actually worn in the past and because I genuinely love the vintage aesthetic. I felt like I was stepping out of a moment in history. This look was probably my favorite. 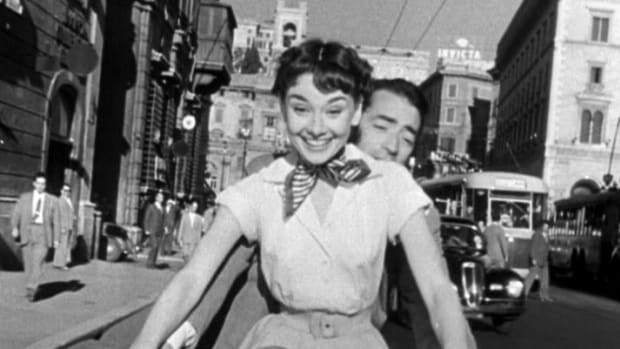 I thought I had seen every way a button-down could be styled, but I had never seen the way Audrey often rocked one. She wore a similar outfit in the boating scene in Sabrina, and I was able to make it my own by wrapping my button-down around my waist and tucking it into the top of my pencil skirt so that the line of buttons was a bit askew. I think this Audrey outfit is a great example of how you can take a basic item and totally transform it by tweaking the styling. I realized, that’s why so many people love her style. 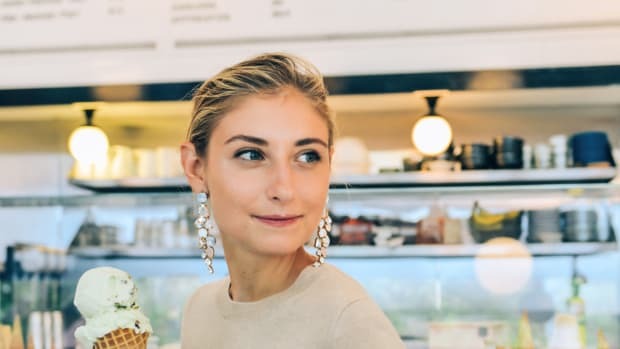 She’s so good at taking a wardrobe staple and making it beautiful, which makes women everywhere feel like they don’t need to go overboard with an outfit to be lovely. Breakfast at Tiffany’s was a defining film that solidified Audrey as a style icon, but instead of interpreting the black gown and pearls look, I went for the ending scene of the film. 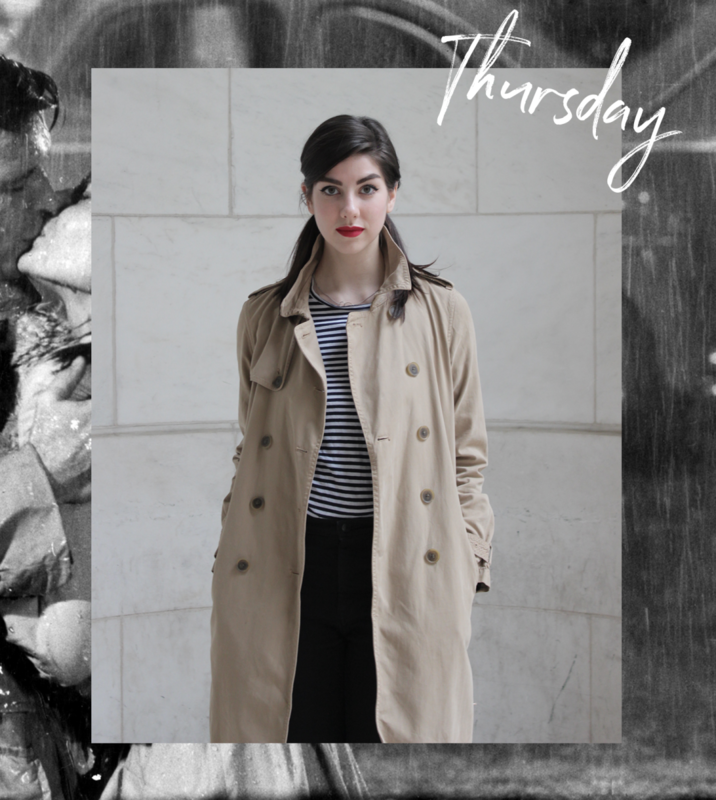 Her trench coat and pigtails are an iconic look we often forget about and one we can easily make modern. I haven’t worn pigtails in years, but I’m actually sort of into them now (I know, I know). 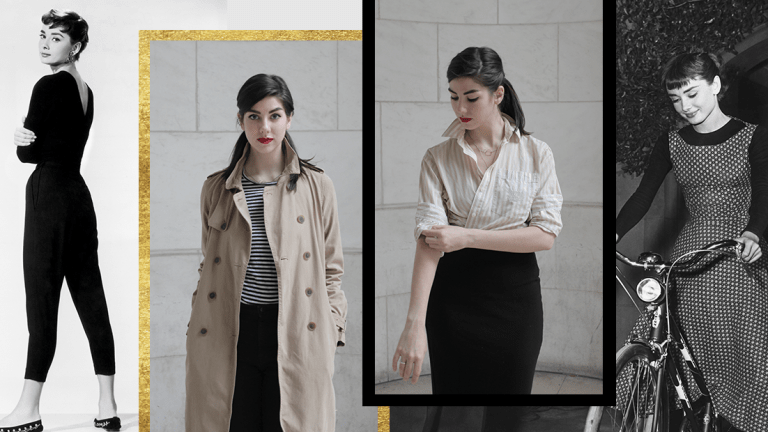 The combination of the youthful pigtails and mature trench coat creates a fun contrast that I’ll definitely be wearing again. 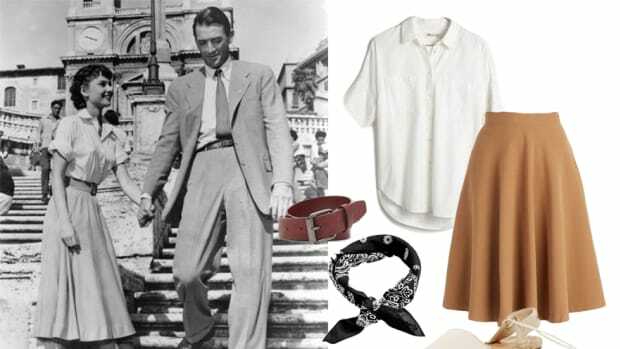 I also noted that Audrey had a knack for taking masculine items and putting a feminine flair on them. Whether she was wearing loafers, oversize button-down shirts, or trench coats, she always found a way to feminize her tomboy-chic look. As I spun through the busy crosswalks of NYC singing, “The hills are alive with the sound of music!” I realized I was channeling Maria von Trapp more than Audrey. People definitely looked at me with side eyes (even when not singing The Sound of Music), confirming that this Sabrina outfit did not translate into modern-day city life. 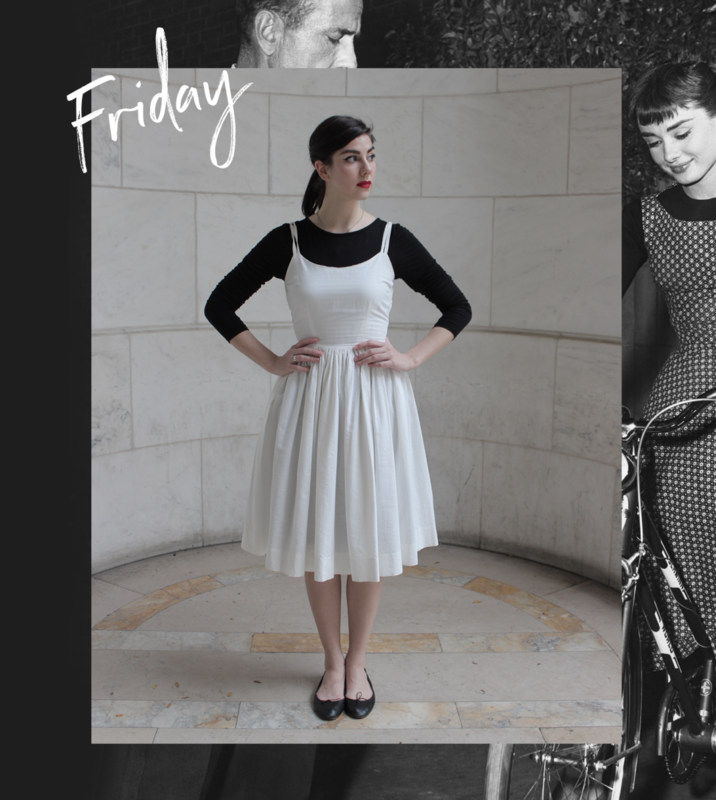 I’ll be honest and say that after my week of Audrey outfits, I would still choose a kooky outfit over a simpler one. 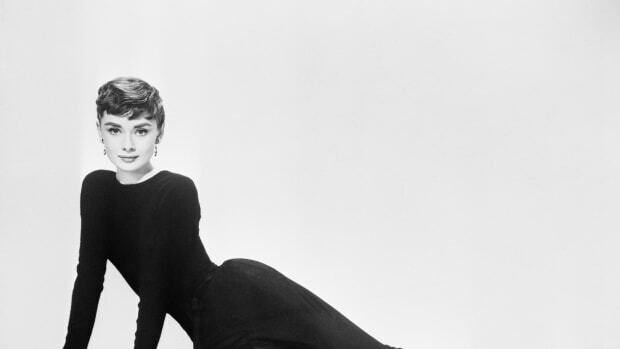 But I’m just staying true to my personal style, like Audrey did with her own. And I think that’s why people are so drawn to her. Her classic style complemented her genuine personality, inspiring women everywhere to be true to themselves as well. So even though I won’t be wearing another black-on-black ensemble any time soon, I still think there’s a bit of Audrey shining through whenever I express myself in one of my signature eccentric outfits. P.S. I’m definitely an Audrey fan now.